Behçet's disease is a multisystem disorder characterized by recurrent oral aphthous ulcers, skin lesions, genital ulcers, and ocular lesions. The disease often leads to blindness in severely affected individuals. It is most prevalent between the second and fourth decades of life. Behçet's disease is found predominantly between East Asia and the Mediterranean basin. It is uncommon in the American continents, Oceania, and sub-Saharan Africa. Distribution of uveitis and intraocular inflammation may differ in different regions of the world. In Japan, Behçet's disease is one of the three most frequent diagnoses in patients with uveitis. The highest prevalence rate of the disease has been reported from Turkey. This disease is strongly associated with the major histo-compatibility complex antigen human leukocyte antigen (HLA)-B51, first reported in 1973. Population with high prevalence of HLA-B51 lies predominantly north of the equator, spanning Japan, and Western Europe between 30° and 45° N.
The frequency of ocular involvement in patients is thought to be between 50% and 70%. The characteristic ocular feature is a relapsing uveitis, which may involve anterior segment, posterior segment, or both. Classification of patient's uveitis is important both therapeutically and prognostically because those lesions that affect posterior part of the eye tend to be persistent and blinding. The disease may be more severe in men than in women. Painful aphthous oral ulceration that has recurred at least three times in a 12-month period. Retinitis pigmentosa (RP) belongs to the group of pigmentary retinopathies, a generic name that covers all retinal dystrophies presented with a loss of photoreceptors and retinal pigment deposits. 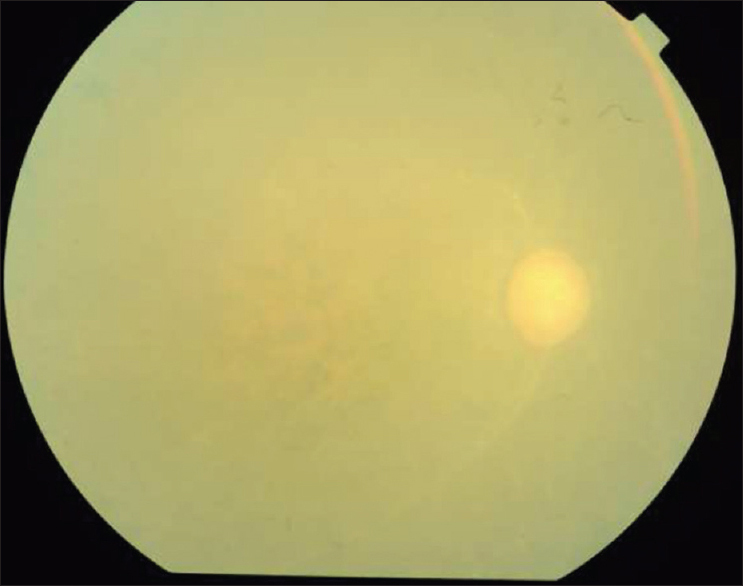 RP is a retinal degenerative disease characterized by pigment deposits predominant in the peripheral retina and by a relative sparing of the central retina. In most of the cases of RP, there is a primary degeneration of the rods photoreceptors, with secondary degeneration of cones. Thus, the typical RP is also described as a rod-cone dystrophy, which rods being more affected than cones. This sequence of photoreceptors involvement explains why patients initially present with night blindness and only in the later life would suffer visual impairment in diurnal conditions. The visual acuity is preserved in early and mid-stages. Patchy losses of peripheral vision evolving to ring shape scotoma, and eventually tunnel vision. Various degrees of retinal atrophy. Scotopic system (rods) predominates over photopic (cones) system. In 2007, Baklouti K, Mghaieth F, Mhiri N, Ayachi M and El Matri L reported a case of Iridocyclitis in a patient with Behçet's disease and a familial form of RP, the patient was a 55-year-old woman with a history of Behçet's disease presented with acute red and painful eyes and moderately blurred vision. Ophthalmologic examination concluded in bilateral acute hypertensive uveitis. Fundoscopy and fundus fluorescein angiogram showed RP. Regarding the clinical features of Behçet's disease, a study from Jordan done by Al-Aboosi et al., reviewed 20 patients to determine the clinical patterns in northern Jordan and compare them with other countries. Of the 20 patients, 14 were men and 6 women, giving a ratio of 2.3:1. Their ages ranged from 14 to 58 years. All had mouth ulcers, 65% genital ulcers, 65% ocular involvement, 55% joint involvement, 35% skin lesions, 20% vascular lesions, and 5% gastrointestinal involvement. The oral ulcers were the first manifestation of the disease process in 70% of the patients. Skin lesions, genital ulcers, and involvement of the central nervous system and the pulmonary system were less frequent. Another study from China done by Yang P, Fang W, Meng Q, Ren Y, Xing L, and Kijlstra A aimed at determining the clinical features of Behçet's disease in Chinese patients, four hundred thirty-seven patients were diagnosed with Behçet's disease. There were 319 male and 118 female patients. Panuveitis was the most common type of uveitis in both genders, although anterior uveitis was seen more frequently in females. Retinal vasculitis, vitritis, and retinitis were the most common ocular manifestations in these patients. Cataract and macular edema were the most common complications. Oral ulcers were the most frequent extraocular manifestation, followed by dermatologic lesions and genital ulcers. Neurological diseases: Neuronal ceroid lipofuscinosis, Joubert syndrome (JBTS), Autosomal dominant cerebellar ataxia type II (SCA7), Myotonic dystrophy, and Hallervorden-Spatz syndrome. No reports of association of RP and Behçet's disease were found in the literature. Mouth and genital ulcers: 2 years. Until this stage, the patient was not on regular follow up with an ophthalmologist, became completely blind, and developed bilateral cataract and glaucom. No history of refractive error. Despite the long struggle with her illness, the patient managed to complete her university education. No family history of long term illnesses. A 28-year-old female with nyctalopia, skin hyper-pigmentation, oral and genital ulcers has been diagnosed as RP with Behçet's disease; she is on treatment and her condition is static. 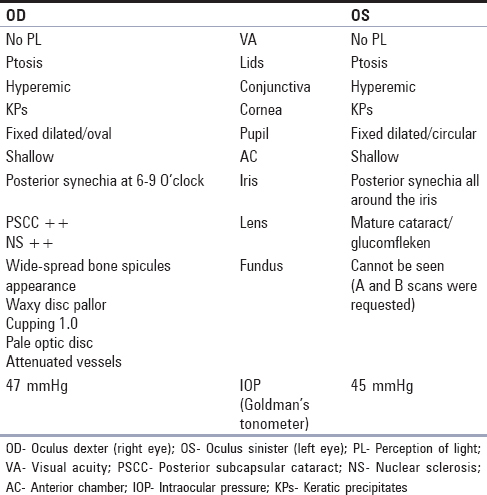 The Summary of ophthalmic examination of our patient was summarized in [Table 1]. Behçet's disease is uncommon in Sudan. It is found predominantly between East Asia and Mediterranean Basin, especially in Turkey. In this report, we found that the patient has RP associated with Behçet's disease. She was using systemic steroids for long time without any ophthalmic follow up until she became completely blind. Although she is highly educated, she was not concerned about her progressive visual loss. She has mature cataract on her left eye. 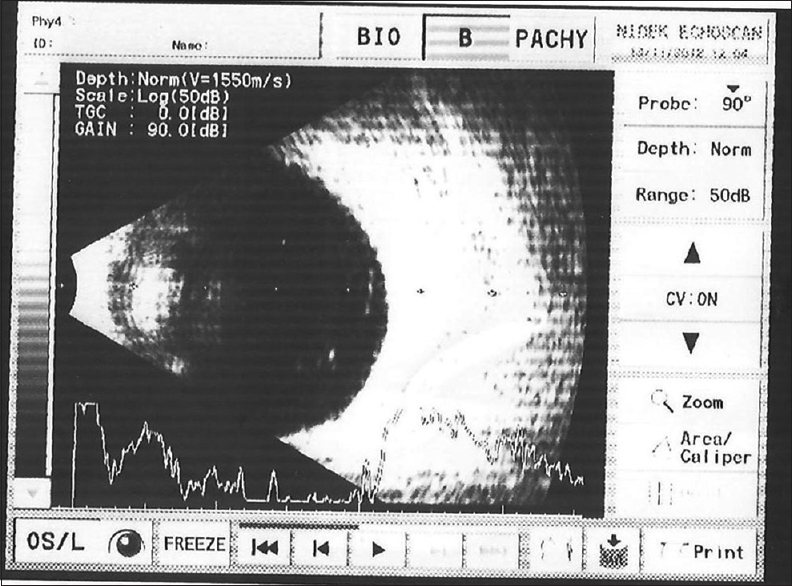 A-B scan of the left eye showed vitreous opacities [Figure 2]. 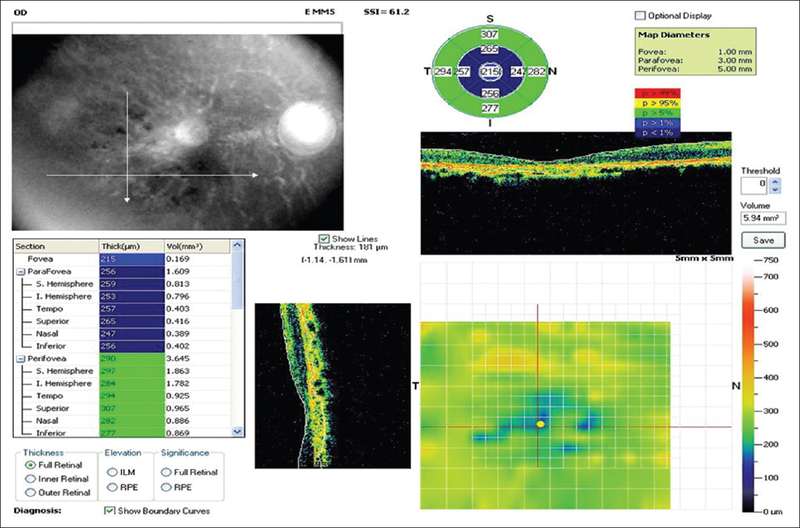 Right eye showed chorioretinal atrophic changes, RP signs and full optic Disc cupping on the Fundus photography [Figure 3], Fluorescein angiography in [Figure 4] and the optical coherence tomography [Figure 5]. 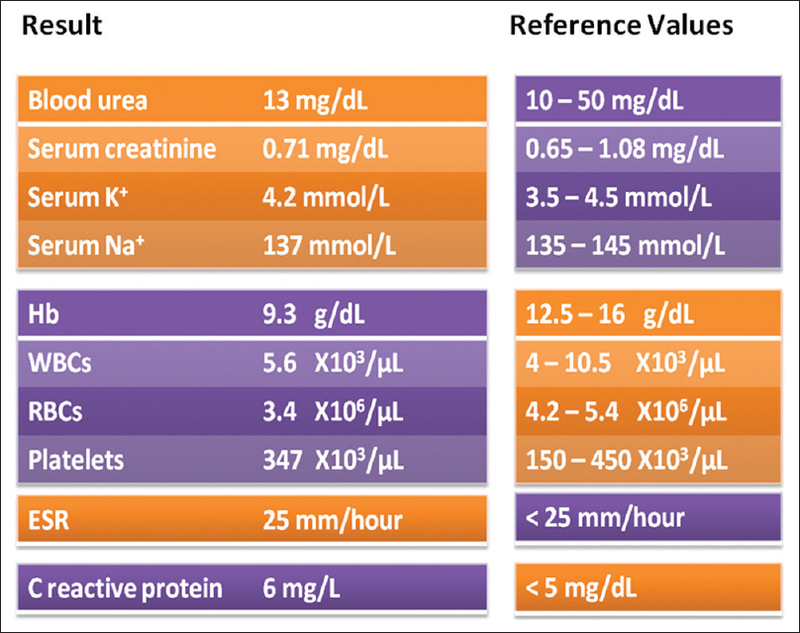 Her blood investigations showed low hemoglobin and slight C-reactive protein increase [Figure 6]. Here, we are reporting a case with Behçet's disease and RP; we found only one similar case report with the same association between these two diseases, which was a case of iridocyclitis in a patient with Behçet's disease and RP reported from France in 2007. We hope that this might draw the attention to a possible association between the two diseases and generate more research in this field. Behçet's disease is uncommon disease among Sudanese patients, and it has not been known to co-exist with RP worldwide. So, it needs more researches and case reports to focus on their association. Kitaichi N, Miyazaki A, Iwata D, Ohno S, Stanford MR, Chams H. Ocular features of Behcet's disease: An international collaborative study. Br J Ophthalmol 2007;91:1579-82. 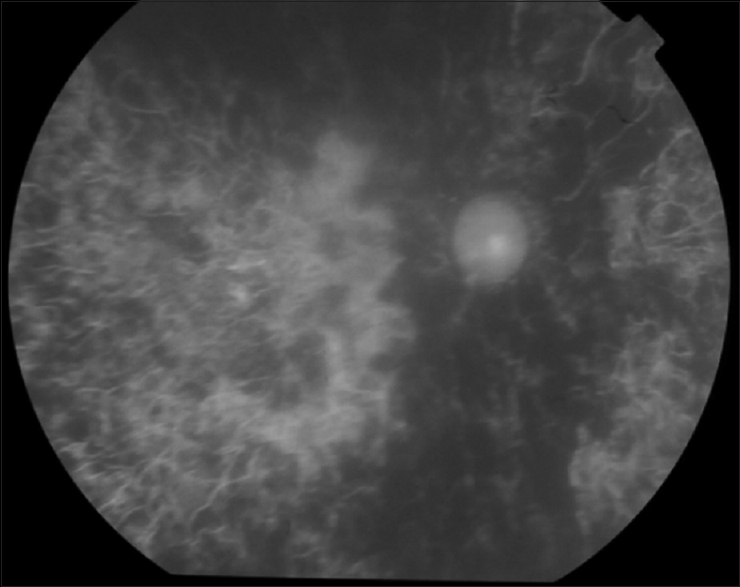 Baklouti K, Mghaieth F, Mhiri N, Ayachi M, El Matri L. Iridocyclitis in a patient with Behçet's disease and a familial form of retinitis pigmentosa. J Fr Ophtalmol 2007;30:e25. al-Aboosi MM, al Salem M, Saadeh A, al-Jamal M, Hijawi M, Khammash M, et al. Behçet's disease: Clinical study of Jordanian patients. Int J Dermatol 1996;35:623-5. Chung YM, Yeh TS, Sheu MM, Chen MS, Wen MS, Tsai HY, et al. Behcet's disease with ocular involvement in Taiwan: A joint survey of six major ophthalmological departments. J Formos Med Assoc 1990;89:413-7. Hamel C. Retinitis pigmentosa. Orphanet J Rare Dis 2006;1:40.